With all our clients, those that have jumped on newsletter (email marketing) systems for sales and client relationship development have found much success from this outlet. We highly recommend developing a strategy to capitalize on newsletters as a means of connecting with past & future clients throughout the year, and distributing valuable information. Right out of the gate it's worth noting that while we are talking about newsletters we are also conducting a conversation about email marketing. For simplicities sake, we've combined the two. But for a quick definition: newsletters are akin to traditional newspapers (stories, articles, advice, opinions...) whereas email marketing is strictly transaction driven content and material (sales, specials, discounts...). Let's start with #1, why don't more people utilize Newsletters? Here's a list of common reasons. #1 - Why people don't use Newsletters for their business. Reason #1) "I just don't have the time to commit to writing a newsletter." Our Answer: Newsletters shouldn't dominate your life. That's first and foremost. In fact, we firmly believe that no aspect of your business should dominate your life. That said, with a proper strategy and dedication a newsletter can easily be produced once a month, or even quarterly. It's as simple as setting aside 2-3 hours on the second Tuesday of each month to produce a proper newsletter. Another thing worth considering is that newsletter themselves do not need to be long. If anything the shorter they are the better, as long as shortness isn't owing to laziness, but is an actual sign of respect to your subscribers that you want them to quickly learn, and take action. So, keep the newsletter short for your subscribers, and it will also help you to produce them regularly. It is important to note that newsletters are not the be-all end-all. But they should, in fact, be a means to be informed and then take action. A newsletter should provide seamless navigation from the newsletter to the website because it's only on the site that someone can take action and take advantage of discounts, sales, incentives or really truly learn more about your business. "53% of emails are opened on mobile devices" - Campaign Monitor -- with that in mind it's best to keep them short and to the point! "75% of Gmails 900M users access their accounts via mobile devices." - TechCrunch - Make sure to keep those newsletters short! "Mobile readers who open an email a second time from a computer are 65% more likely to click through" - Campaign Monitor - Hopefully now you get it... short is good! But it also shows that there should be clear navigation from the newsletter to the website. Reason #2) "I don't want to spam, or burden people with unwanted newsletters if they want my product they will just show up." Our Answer: We get it. Totally do. Who wants spam? But the reality of it is that if you've got a great business, with excellent services and desirable products people are willing to subscribe. The last thing that we ever want is a company forcing us to subscribe to a newsletter. We've all been there... while checking out finalize a purchase, or just trying to access info... and we all collectively hate that experience. It's a poor quality User Experience. But there are other strategies that do capitalize on engaged visitors and people that really do want to subscribe (see below: Best Practices for Newsletters #9). These are the strategies that we always recommend because they will also provide a significantly greater return on your on investment. Your mailing list doesn't have to be massive to provide significant value for your business. The key takeaway, do not spam people, do not burden them, but you can provide them significant value. Be genuine, and authentic every step of the way and remember that your subscribers or potential subscribers are people too! As an additional thought, businesses need to provide "motivation." It's our duty to present products that solve problems for people and give true value. If people want something, a newsletter can be an excellent opportunity to provide motivation for people. It's not safe to assume that if you build it they will come, especially if they don't know it exists. Reason #3) "I just don't have anything to share in a Newsletter." Our Answer: That's probably not true. One aspect of our business that we love is getting to learn about so many different types of businesses. If there's one thing we know to be true, it is how little we actually know. Every businesses newsletter will be different because every business is different, and operated by unique individuals. A tax firm's newsletter should look significantly different to a wholesaler of plants, in the same way, a newsletter for a music store should differ from a newsletter from a pest control company. It's not hard, but it does require some careful consideration. We firmly believe that any/all businesses & organizations have information to share that is valuable to people. It all boils down to simply not being a priority, and not knowing the advantages. #2 - So why should I have a newsletter? Okay so that list could keep going but I think you the get the idea. Newsletters & Email Marketing works and can be a fantastic source of additional revenue. But there are some other benefits of Newsletters as well. So let's talk about some of the best practices EvenVision harnesses when development newsletter systems for our clients. We've had the opportunity to help a few people out over the past years with their newsletters. In that time we've fleshed out a few best practices for email marketing and more specifically newsletter strategies. They cover everything from increasing sign-ups naturally, to increasing click-through conversions, and market research and exploration. We hope that you find our 10 best practices below useful and actionable for your business. 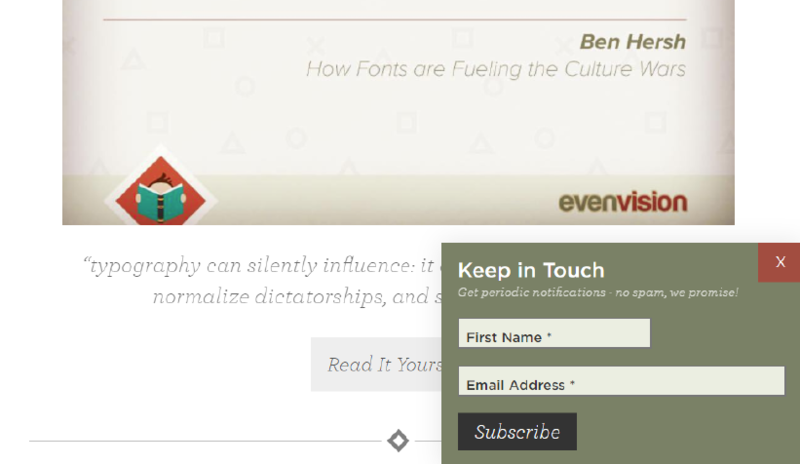 Have a signup form on your website in the footer. It seems like common sense but you would be amazed at how many people do not have one on their website but rely instead upon people signing up at the store, or location of the business. Furthermore, the signup form should be very simple: Name, email address. That's all that is really required to get started. We also recommend that the signup is located in a logical location. The footer is a natural area to provide a signup form as people who scroll to the bottom of the site have already shown some interest in the content and are more apt to signup in comparison to those that don't scroll down. In the same way that a website should be responsive, newsletters should likewise be designed with mobile friendliness. Recall from above, the vast majority of emails are opened on mobile devices first. While mobile e-commerce transactions make up about "40% of the global e-commerce", the reality is that typically speaking people will check their email first via their mobile device and then follow up with completing purchases via their desktop. That said, mobile transactions are increasing in percentage of the total made year by year. Keeping in mind the previously noted best practice, when users open up emails you've got to make sure to keep the brief and to the point. There should be no confusion regarding the main purpose of your newsletters, or the means by which someone can convert and follow through with the purpose. Send out different types of newsletters! Mix things up every so often and provide newsletters that target different types of people and provide different types of messages. This can not only help keep the newsletter from becoming boring for you to produce but also can let you explore and test the waters with different types of content on the same people to see how they respond. It's market research! - Case Example - Our recently work with Singing Tree Gardens we recommended splitting his standard newsletter into two different types. Weekly Sales Email Marketing - these are designed to be quick and brief emails that alert people to plants that are currently on sale. Monthly Plant Digest Newsletter - first of the month long-form newsletters that dive into a specific plant or care instructions. The overall result of splitting the email up into two different types was an overall decrease in time required each week to produce, in addition to an increase in click through rate for the sales newsletters to over 8%. Schedule an event in your phone calendar to lockout time to work on your email marketing. The most common issue we hear with not following through with newsletter/email marketing strategies is a lack of time. We always recommend then including a repeating event in your phone calendar to notify you when it's time to work on the newsletter. This way you've blocked the time out, and get a constant reminder. It sounds cheesy, but surprisingly it works well for pretty much every aspect of life. Give it a shot! Start a blog first, then follow up with a newsletter. If you're struggling to come up with topics to write about in a newsletter try first adding a blog to your site and writing on that. Start sharing that content, and take in feedback. Once you've found something that people are interested in, take that blog content, condense it down to a single paragraph, and shoot it out as a newsletter with the option of reading more on the site. Remember: The newsletter should be designed to inform people and allow them to take action. Ideally, that action is to go to your site and explore, learn more, or purchase a product. Be social, and make the newsletter social as well. Newsletters should drive traffic to your site. Traffic on your site should drive traffic on social media. Make sure that it's easy to share contents of the newsletter, and of your site. This will allow for your site to start garnering the social proof required to rank well for SEO. Furthermore, include social media links in your newsletters. Providing the option for people to follow you online is always encouraged. After you shoot out a newsletter you can also provide encouragement for social media follower to subscribe by posting about your recent newsletter special deals or discounts. Archive your newsletters on your website for maximum returns on SEO. By setting up an archive on the site of your Newsletters you can add consistently to your sites pool of Good Content. Check out how we have our Newsletter Archive setup. That said, not all archives are equal. Ideally, your newsletter distribution system allows you to export full HTML files and drop them on your website. But in the instance that it doesn't we recommend exporting your newsletters as PDF's as they can be read by search engines easily. Check out this article "8 Tips to Make Your PDF Page SEO Friendly" by the Search Engine Journal for more information about PDF's and their impact on SEO. Furthermore, in a perfect world, the newsletter archive would also be able to be searched by visitors, and reviewed with ease. In the case of Singing Tree Gardens we've recommended taking the Plant Digest long-form newsletter and setting up and archive of these for people to reference as their chalk full of great quality content. We will build it soon! Capitalize on engaged consumers through analytics data. What is the best way to sign people up? Well first off have a sign-up option on your website. Secondly, avoid the pitfalls of being "pushy." It's probably universally hated when a "Sign up for our Newsletter" pop-up takes over the full screen. In fact, I'll just say it. I hate full-screen pop-ups. In reality, these are catastrophically annoying and there are significantly better ways to provide people the motivation or stimulus for your newsletter without ruining their user experience by leaving them with a bitter taste. - Strategy for not being annoying #1 - Capitalize on engaged consumers at the end of a product purchase experience. Allow them to select an option to receive a newsletter with sales and discounts. If they haven't selected that option, follow up with a purchase congratulations email that encourages signing up after they've had time to experience the quality and value of your product. - Strategy for not being annoying #2 - Capitalize on engaged consumers that are on your site. By accessing Analytics data you can very quickly find out how many pages the average visitor will go to on your site. For some websites, this can be as high as 10, or as low as 2.5. Either way, you can setup a system on your site the provides a small notification in the bottom right/left-hand corner of your website once a person has traveled through more than the average number of pages. It's that simple because if the average number of pages visited is 10, then someone who visits page 11 in more engaged with your site's content. Provide them the motivation and they will be quick to sign up. People are attracted to businesses with personality. It's the simple matter of not being able to target everyone. In truth, not everyone will care about organic craft brewed beer. But those that do will love it. If you have a company with a brand, an identity, a personality, let your newsletters speak with that same tongue. Reach the people that care the most by making sure you're speaking the language that they know your company by. This is hard to pin down in exact specifics, but one simple idea is to make sure your newsletter reflects the design of your website. It should have the same logo, same/similar fonts, and have the same "button" design so that when people travel from one to the other there is a clear understanding of origin. Newsletters & Email Marketing are great ways to bring people to your website, convert them into a customer, and keep in touch with people that really care about your products/services business/organization. There are techniques available that allow a newsletter to transcend traditional utilization and become a real powerful asset for your business and drive traffic to your website through good SEO. Never underestimate what you can achieve with an email. And if you're looking for a strategy to kick start your business, or help take it to the next level this is an amazing location to start. So go and send something out! Or do you need help getting started? Let us know! We are here to help.